Almost everyone has a pair of these in their neighborhood. 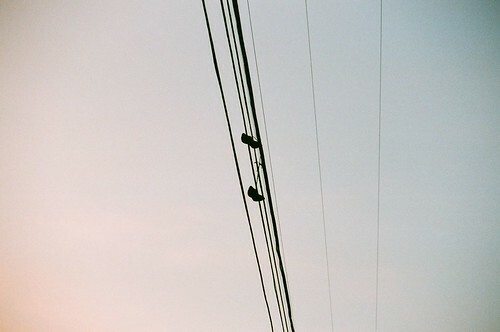 Look to the telephone wires and you just might see a pair of sneakers hanging like a little urban ornament. And if you're like me you stop for a second and wonder how they got there. Well The Mystery of Flying Kicks is a documentary that explores different theories using photos and story contributions from around the world. I watched this short film during SXSW and meant to comment on it shortly after but, well, forgot. Better late than never. Check out the trailer below and the site for an on-going blog. You can also submit your own stuff. The Mystery of Flying Kicks - Trailer from Closer Productions on Vimeo.